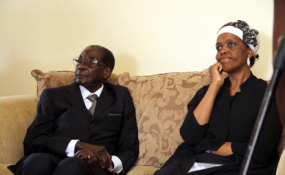 Former president Robert Mugabe and former First Lady Grace Mugabe (file photo). Zimbabwe's President Emmerson Mnangagwa says the country's former ruler Robert Mugabe and his family are not immune from prosecution, dispelling reports that the former first family had been granted immunity. Mugabe, who had ruled the southern African nation for 37 years, stepped down from power last November following a de facto military coup. Mnangagwa was speaking on his maiden trip to the World Economic Forum (WEF) in Davos where he also rebuffed reports that government had paid Mugabe a $10 million exit package. "No we have not given anybody any immunity. What l have promised to my former president and the founding father of our nation former President Mugabe is that first we give him a package... a very lucrative package," Mnangagwa said. Mugabe still receives his salary and enjoys benefits such as state funded security,travel by first- class and frequent medical check ups in Singapore. "We are not saying that if anybody commits a crime then their former status will stop the police dealing with that issue. My approach is zero tolerance to corruption and there are no sacred cows in dealing with that". Since coming into office last November Mnangagwa has promised to stem corruption with a number of high profile graft cases involving former Ministers in Mugabe's government being hauled before the courts. Mnangagwa said elections would be held earlier than July insisting that his ZANU PF party will respect the outcome of the polls. "We are very clear the purpose of an election is to have the electorate select a team or persons whom they think addresses their challenges and their needs. If we lose elections thats it whichever party wins the election will proceed to take the reigns of power because they will have appealed to the electorate perhaps with better policies and so on." Mnangagwa has extended an invitation to the European Union (EU) to come observe the polls. Read the original article on The Source. Copyright © 2018 The Source. All rights reserved. Distributed by AllAfrica Global Media (allAfrica.com). To contact the copyright holder directly for corrections — or for permission to republish or make other authorized use of this material, click here. Zimbabwe: Should We Celebrate the Govt-Zimplats Deal or Worry?